Do your children ever beg you to let them paint, cut, use markers or chalk? My children do and sometimes (much of the time! ), I have to turn them down for one simple reason– not enough time in the day! There just isn’t time to help my children find the supplies they need, supervise the creation of their art project and then help them clean up the mess (while making dinner, filing out a school form, changing a diaper, etc…). Once your children are old enough to follow basic rules when using art supplies (“paint goes on paper, not your tummy” or “scissors are for paper, not your hair”), usually around the age of 2.5 years, then it is time to take your art supplies out of hiding and put them on display. 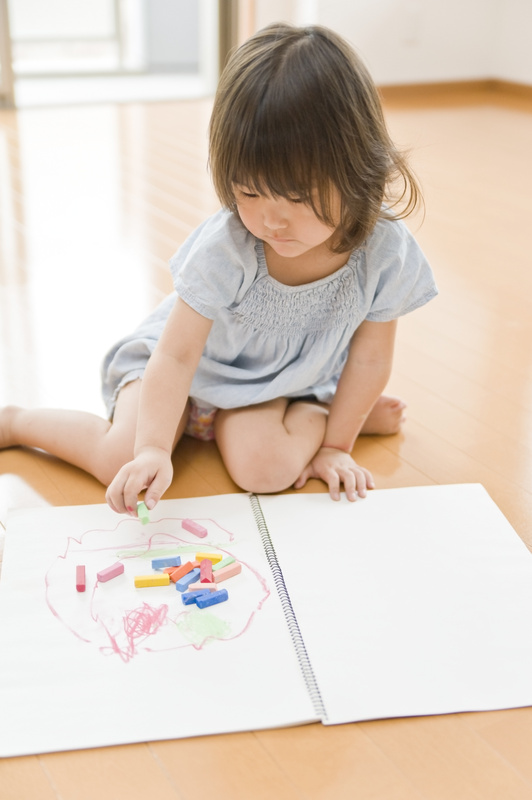 Putting art and clean-up supplies within sight and reach will enable your child to create and clean-up their own art independently. The supply display case is the most significant addition to my art center. To re-create a similar art center at home, your will need a simple bookcase, organizational bins, art supplies, and clean-up tools. The key to any home addition involving children is versatility. 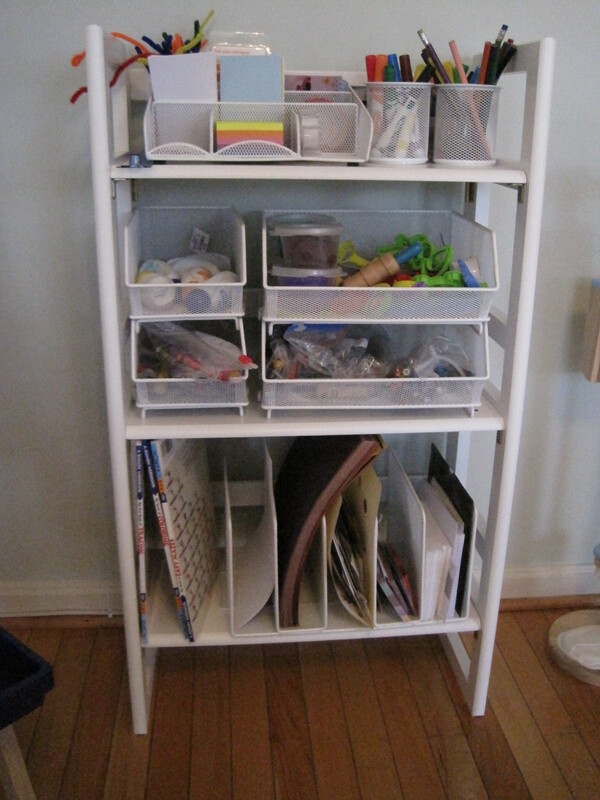 I chose a white folding bookcase from Crate and Barrel. If I ever need to relocate or store the bookcase it can quickly fold up or be transported without loss or damage. 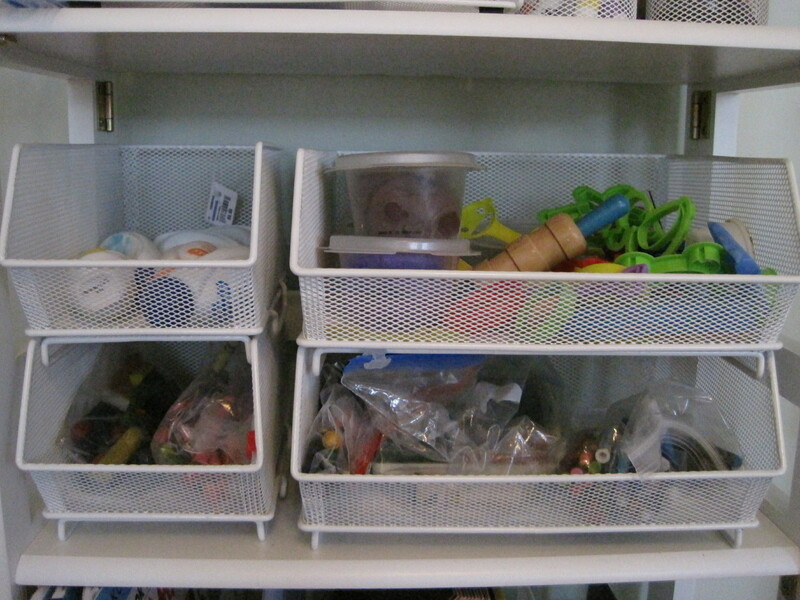 You will then need to purchase simple storage bins and organizers. The Container Store has an excellent selection. 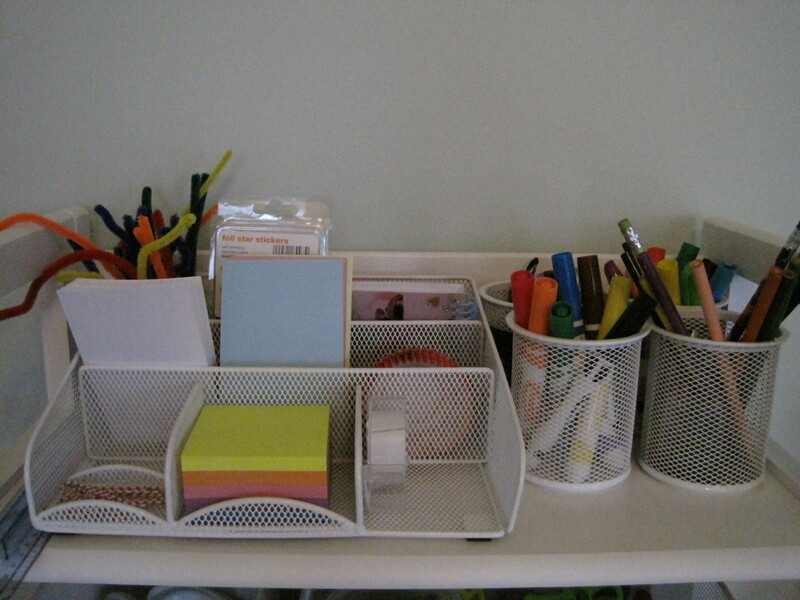 I used their line of mesh office organizational pieces. I like mesh because it is see-through, which entices children to help themselves when passing by. Plastic transparent bins also work well. Let’s look shelf by shelf at what I included. (Keep in mind, the items included are aimed at serving children ages 2 1/2 to 5 years of age.) The top shelf organizer includes: pipe cleaners, hole punch stickers, foil star stickers, colored and white index cards, tape, (glue stick if your children are old enough), sticky notes in assorted colors, large red paper clips coated in plastic to avoid cuts, paper cupcake liners (kids love playing with these) and small wire bound notebooks. On the right, there are mesh cups filled with colored pencils, dry-erase markers, regular markers, child-safe scissors and a hole puncher. 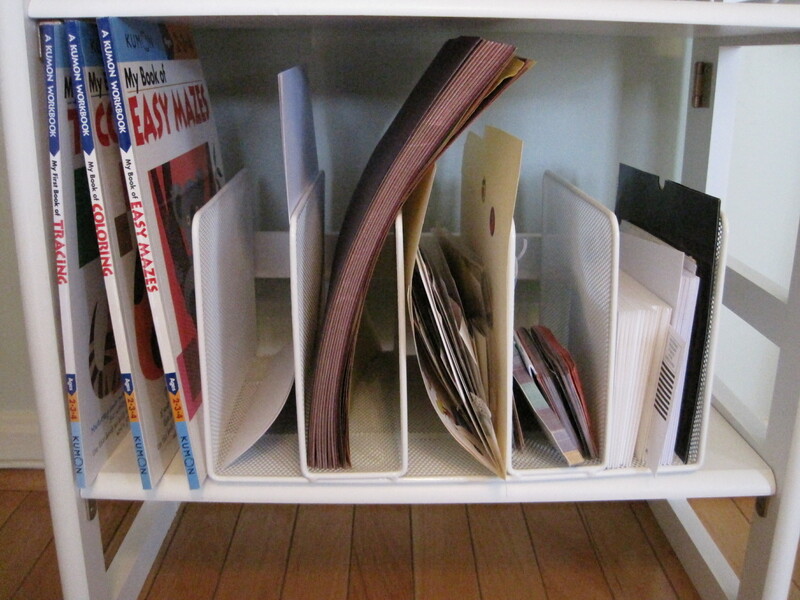 Finally, on the bottom shelf, I used a parallel file unit to store coloring/work books, white computer paper, construction paper, a file of stickers, a collection notepads, and various envelopes. Young children love being given age-appropriate responsibilities. They can find art supplies, use them, put them away in the proper places and clean up on their own. When you first debut your art supply case, make sure you show your children where everything is located and go over any rules for use. Some people may find using picture labels on the bins helps children put the items back in the right place. 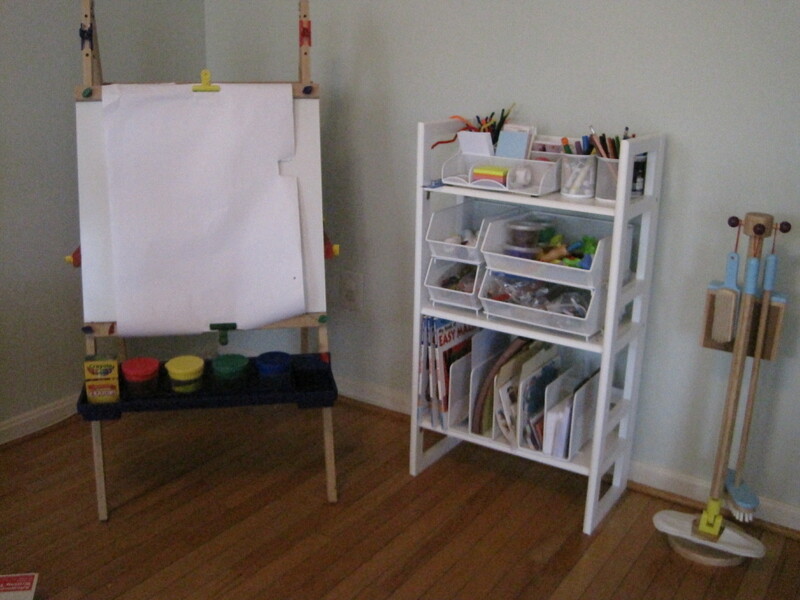 Make a game of testing your children on where supplies are stored and teach them how to clean up. You will likely need to repeat these lessons for the first couple of weeks, but don’t give up. Your children will learn to use the supplies properly if you take the time to train them. Keep a dust pan and hand broom nearby (and possibly paper towels or wipes) so they can be in charge of sweeping up scrapes of paper on the floor. Art at home is possible with the help of a little organization. Enjoy and share your questions, ideas and success stories! Most products mentioned in this article are available for purchase at The Intelligent Nest Toy Store- Powered by Amazon.com. Click here to visit!